I started by drawing a rough sketch of the design, then scanned, darkened and blew it up to use as a template. I tend to draw really, really lightly, so it’s hard to see the original in photos/videos. After that, I simply inked in the geo aspects first, then sketched in the rest with pencil. I used a photo found via Google Images for reference of the swan and made up the rest. This design is available to buy from my Art Rookie store as prints and greeting cards. I have some more designs on there and will be building on it over time, so be sure to check by for new pieces! Question is…what to fill it with? :O The plan is to have signed art prints and maybe tote bags and gift cards for sale at NAOHOA. I’ve started making some designs*, but what would you like to see? * Designs will be available to tattoo (one person per design), but please bear in mind that I’ll continue to sell them as prints, so they won’t be as exclusive as my usual work. Wowzers it’s been hot lately! 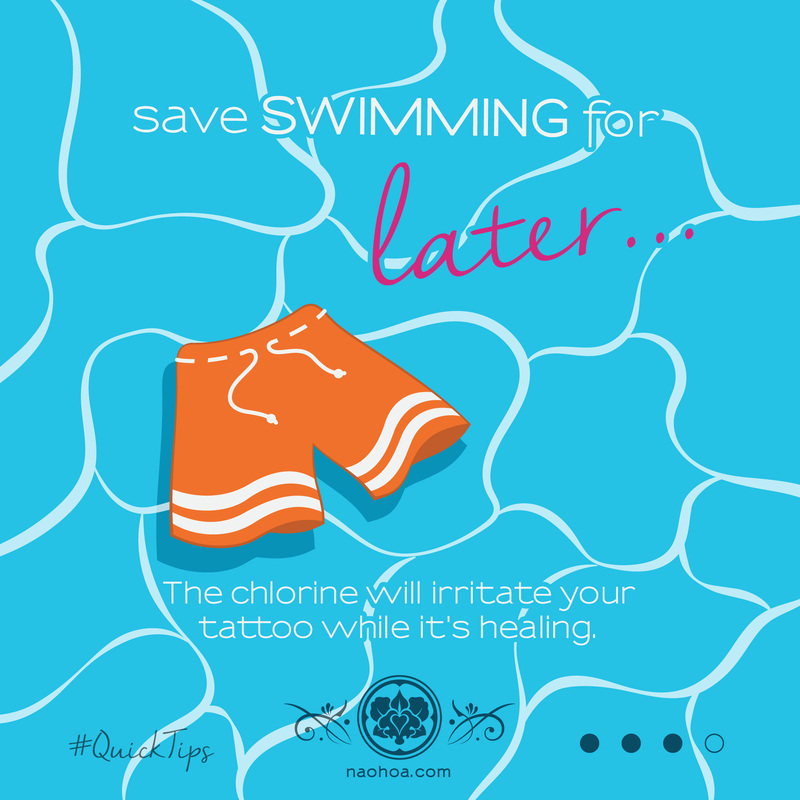 Have you been taking care of your tattoo when soaking up the rays? 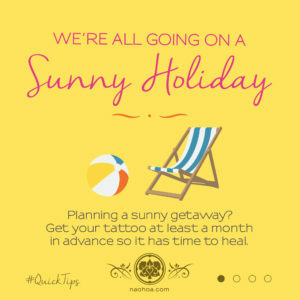 • Get your tattoo at least 2 weeks BEFORE you set off anywhere sunny so it has time to heal. 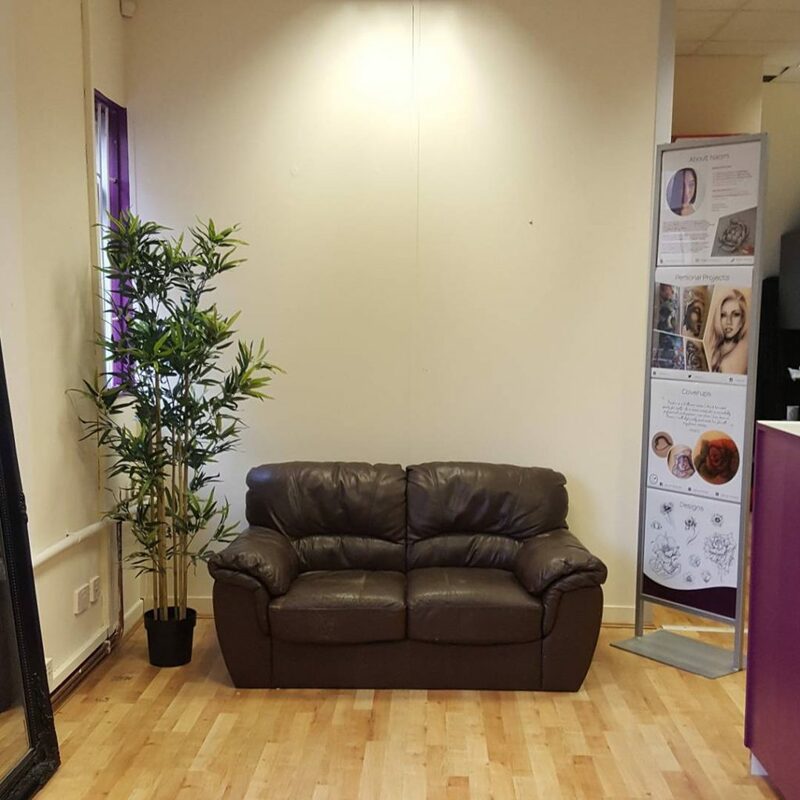 • …to do this, you’ll need to book a Consultation a couple of weeks beforehand so I have time to design your tattoo for you. • Do you have beach trips lined up soon? Make sure you remember to keep your new tattoo covered to protect it from sea, sand and sun. • Is this a design you actually want or are you following current trends? What’s hot this season may not be in the next. 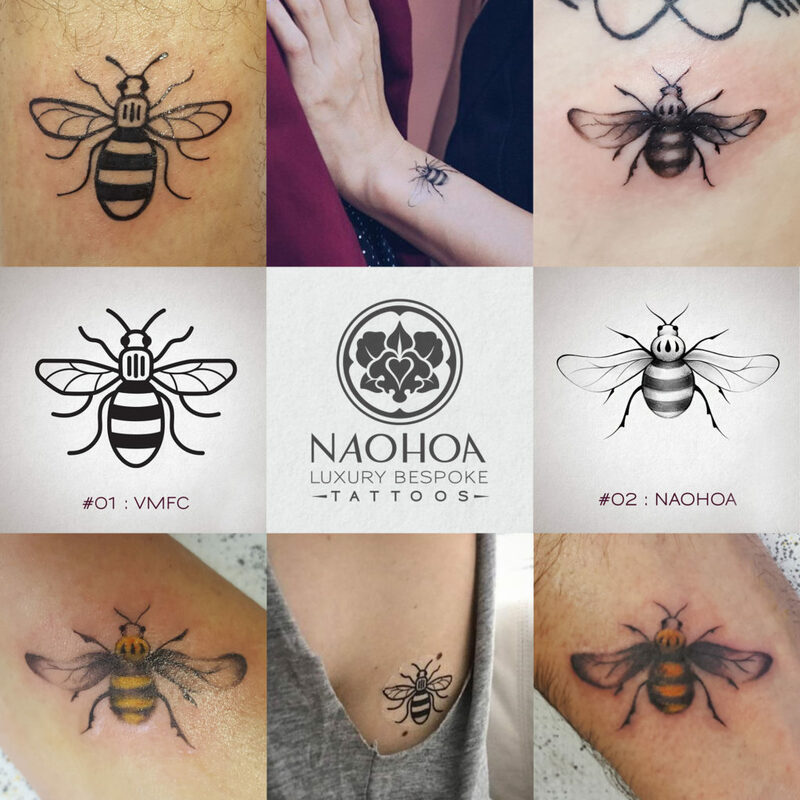 Unlike fast fashion, tattoos aren’t something you can switch out of easily. 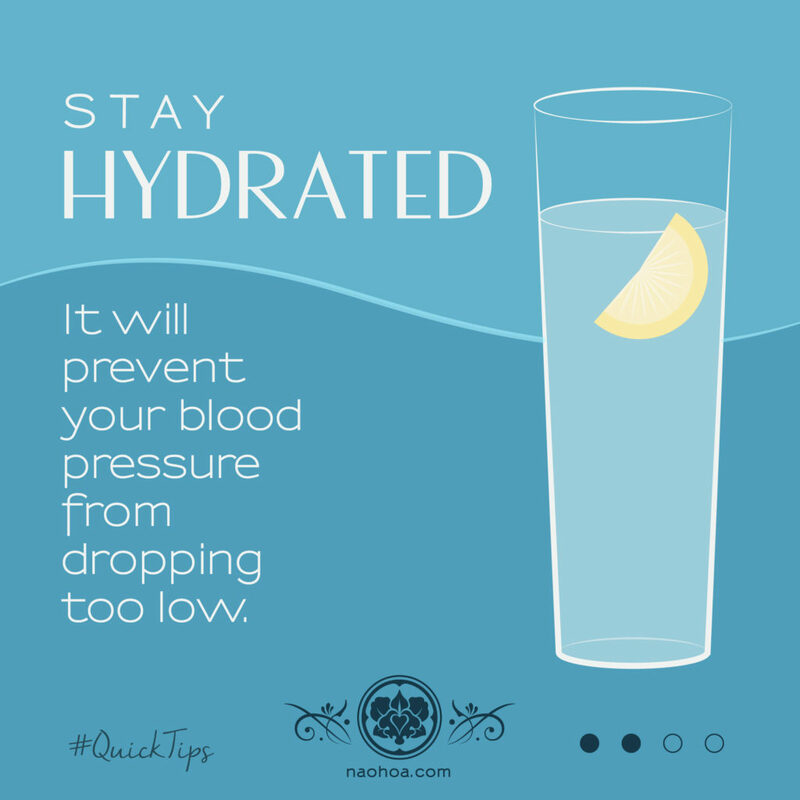 • It’s best to stay hydrated in general, but this is especially important when the weather heats up. I’ll have filtered water ready for your visit and you can enjoy caffeine-free beverages from Waterloo Teas, free of charge*. • If the heat is too much, do feel free to ask for regular breaks. • If you have a long session booked and want to stay comfortable, bring spare clothes to change in and out of so you can leave feeling fresh. * I’ve noticed that clients tend to bleed more after they drink coffee, so I recommend avoiding caffeine before and during your tattoo session. • As always, clean and moisturise at least three times a day (unless using Saniderm). • Do NOT use sun cream on it while it’s healing! • Your new tattoo is essentially an open wound. Take care of it and keep it clean to avoid infection. 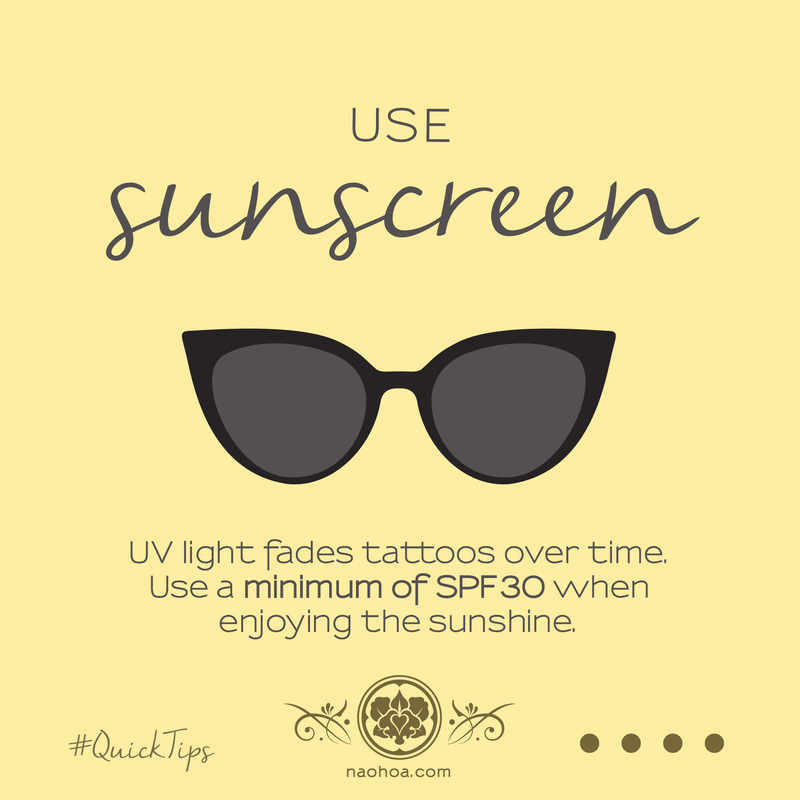 • Cover your tattoo to protect it from the sun’s UV rays. Fresh ink fades faster if exposed and you wouldn’t want to waste it all on the last hurdle! • I’m afraid skinny-dipping is out of the question while your ink is healing. 😜 Avoid submerging in water – especially in swimming pools, where the chlorine will irritate your skin and can cause infection. • Now it’s time to use sun screen! At least 30SPF will do it. 50SPF if you want to be extra sure. 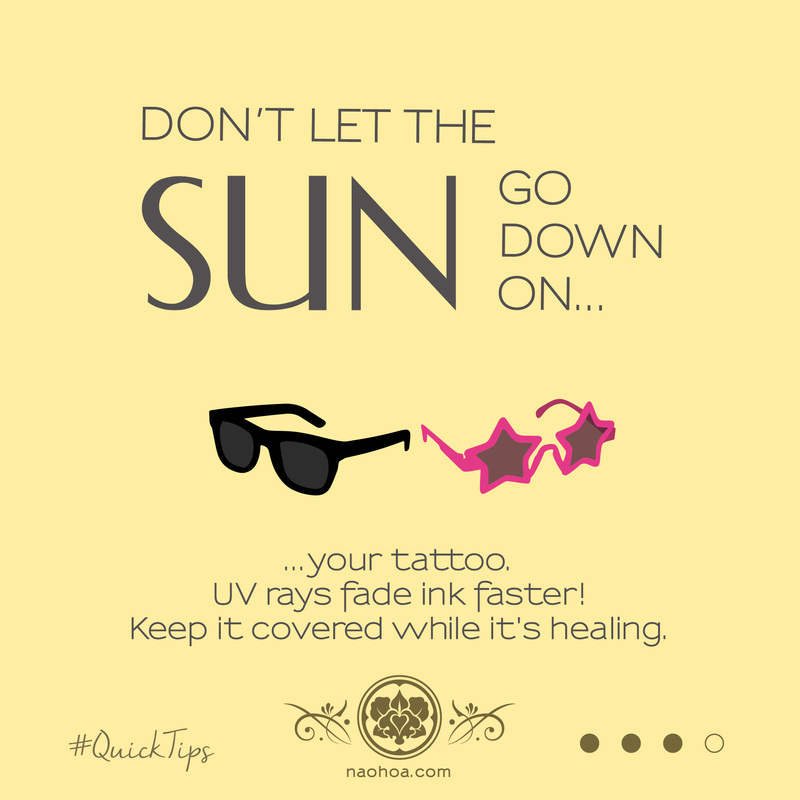 • Ideally, keep your tattoo covered when it’s really sunny to avoid fading the ink. These are tips tailored for Summer. For the full list, check out the Aftercare Advice page. 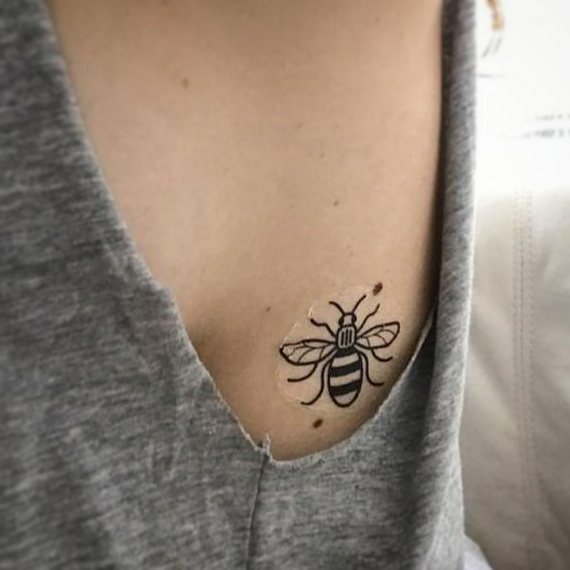 In response to the horrific Manchester Arena Attack on 22nd May, I was approached to do a Manchester Bee tattoo as a tribute and means to raise money for the families affected. The first person to contact me was a Cardiff-based Mancunian and interest soon spread to fellow locals, all happy to save a big trip to Manchester and queuing for hours. 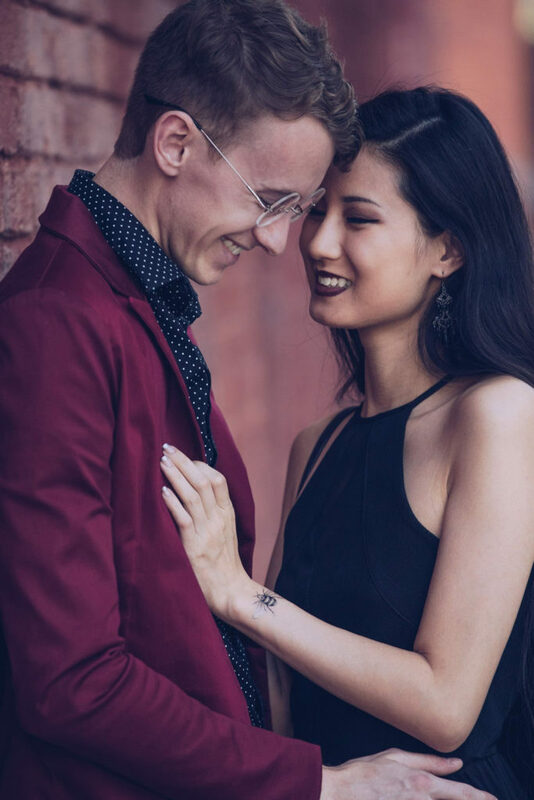 A couple came in for matching tattoos – one of whom had never been inked before! – Client during tattoo session. 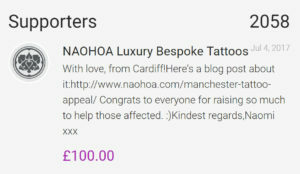 Overall, £88 was raised via tattoos and I topped it up to make £100. It’s been an honour being part of this and helping the families whilst meeting wonderful people. Britain has experienced a cluster of devastating events recently, such as the Westminster Attack, London Bridge and Grenfell Tower…not to mention the unfair surge of Islamophobic hate crimes (including the attack on Finsbury Park Mosque) that continue to rise and cause more pain. Times like this is when we need to be especially mindful of our actions and fellow peers. Please, be kind…life’s too short to waste on hate.